Enter Sovngarde and stop Fildgor's plot. Inside the tombs of Skuldafn, I discovered that Fildgor Orcthane crossed into Sovngarde. To defeat Fildgor, I must follow him there. Talk to Prince Irnskar in Jorunn's Stand. Continue talking to Queen Nurnhilde's ghost. Fildgor forced his way into Sovngarde and is close to stealing her essence. He opened a bridge between Tamriel and Sovngarde. 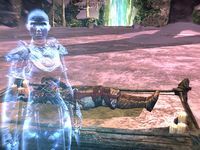 She will speak to the Watcher at the Bridge for you, allowing you to enter Sovngarde as her champion. Exit through the door behind her and to the left, then make your way around the Stormfists and up the stairs to Skuldafn's peak. Step into the light, and you are transported to Sovngarde. Fildgor is working at the altar across from you. "You! You've been a thorn in my side for too long." Knockdowns work well in this fight, and he can use the spirits of the dead to boost his health. However, as much as he proclaims that you cannot beat him, you do. Talk to him. "You beat me. I lose to my cursed brother. Again. Perhaps he is the better ruler. Regardless, in front of my ancestors and my sister, I am undone. Do what you will with me." "What choice do I have? Even with Sovngarde's power to aid me, I lost. The Crown of Freydis rejects me. The thorn in my side became my undoing. You've won. What will you do with me now?" You can choose to let King Jorunn decide or to kill him right away. If you choose to let Jorunn decide, Fildgor says you have strength and honor. He agrees to face his brother's judgement. Regardless, talk to Queen Nurnhilde. You tell her about your decision. She thinks you should have killed him, but she realizes she is cold and detached. Return to Skuldafn through the beam of light. Talk to the king. If you chose not to kill him, the king almost wishes you had killed him because he doesn't want to kill his brother (the penalty for treason). If you have the Persuasion Perk, you can ask the king to spare his life. "Let out enemies tremble at our combined might." 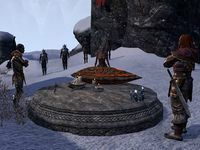 :King Jorunn: "Esteemed allies, I stand before my ancestors and this lonely dragon shrine to seal our pact with great blood." Eyes-of-Steel: "I stand on this mountain, displaying how far the Argonians have come. In the name of my people, I add my voice to form this Ebonheart Pact." General Yeveth Noramil: "I represent the Dunmer and the Tribunal. I stand on this…frigid rock to affirm our place in the Ebonheart Pact. I fervently hope we can move this along since it's freezing up here." Jorunn: "The Nords offer the Crown of Freydis, the symbol of power and wisdom provided by the Pact with the strength and authority of our Nord ancestors." Noramil: "The Dunmer offer the Judgement of Veloth, an artifact of ancient magic. This provides the Pact with our skills and the blessing of the Tribunal." Eyes-of-Steel: "The Argonians offer the Mnemic Egg, sacred symbol of birth and life, thus granting our wisdom and memories of the Hist to the Pact. With these offerings, the pact is sealed. Let our nations become one." Noramil: "Further, the Dunmer call for a single leader to hold this pact together. We believe Skald-King Jorunn is the one to lead us." Jorunn: "Let out enemies tremble at our combined might. I accept the role of High King of the Ebonheart Pact. We have much to discuss here. Please, Champion, return to Jorunn's Stand and tell my son what has transpired." Talk to Prince Irnskar at Jorunn's Stand. He names you the King's Arrow, for your perseverance and striking true. He gives you a reward. if you chose to save Fildgor, he will express happiness at his father's mercy. This page was last modified on 15 March 2018, at 19:32.